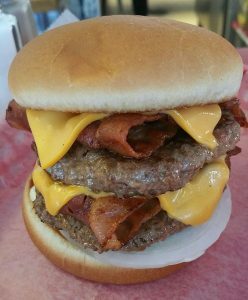 ***** DISH OF THE WEEK (Sunday- 2/3/19- Shake Pit). 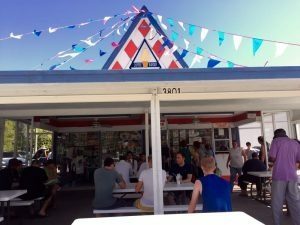 If I hadn’t already eaten there- Shake Pit would definitely be on Jeff Eats’ Bucket List! Posted on August 3rd, 2017. ***** Shake Pit, 3801 Manatee Avenue W, Bradenton, Florida 34205, (941) 748-4016. Got something off the chart terrific for you guys into fast food burger, hot dog, ice cream, shake, fries’ joints -Shake Pit in Bradenton! Real simple concept at work here, order at-pickup at outdoor window- reasonably priced ice cream/ shakes/ burgers/ fries/ hot dogs/ other fried stuff joint with a handful of indoor counter seats/tables and outdoor tables thats been around since 1959, cash only -open every day of the week except Wednesday from 11:30am-10pm! Jeff Eats, Mrs. Jeff Eats and a couple of friends did a recent afternoon stop at Shake Pit and I must tell you, we were like pigs in sh@t- we absolutely loved the joint! Like Jeff Eats said a few seconds ago, like pigs in sh@t!